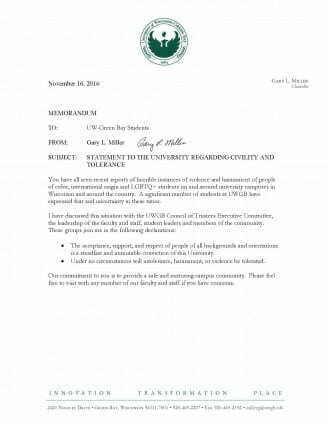 UW-Green Bay Chancellor Gary Miller e-mailed the following message to faculty and staff on Monday, November 21, 2016. As we approach Thanksgiving and our winter holidays, I want to express to you how grateful Georgia and I are to join you in the unique opportunity we have to work together at UWGB. Your commitment to the transforming power of knowledge and understanding, and your deep dedication to our students and this community inspire us each day. Thank you. As you gather with your family and friends during the coming Thanksgiving weekend and through the holidays, we hope you will join us in reaching out to those less fortunate than ourselves. In this we may, together, make our world a much better place.